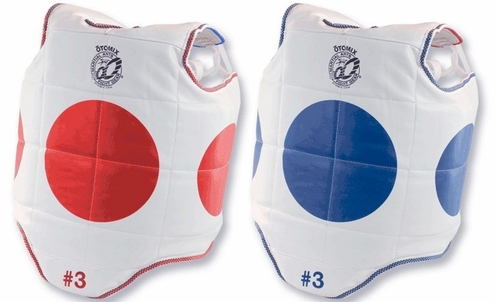 This chest guard is designed for Taekwondo. It features scoring zones in the middle of the chest and on the sides. One side is red and the other is blue so you and your opponent can be recognized and scored properly. Chest guard is soft vinyl on the outside but has a shock absorbent foam inner core for increased protection. The inner core covers the torso and both sides offering kidney protection. Shoulder straps get laced through hoops in the back and tie like shoelaces. There is also an elastic strap that crosses the back and attaches to the opposite side with Velcro. Also available in a solid colored version here.